Last night, this fix it man worked from 7:30 in the morning until 10:00 at night and part of this was helping a coworker wire up a fan center on an older Ruud horizontal furnace. I also had quite the time rewiring a fan center another contractor attempted to wire on an oil furnace. The last time I worked on an oil furnace, Reagan was president, but fan centers are still very much with us as many choose to hold on to older equipment. Usually, this is out of economic necessity rather than being a full fledged cheapskate; to have air conditioning with same still requires it. A fan center to the casual eye is a metal plate with a transformer, a tangle of wires and a relay; nothing more. There are two wires that feed from the coil part of the relay to the green and C or common terminals on the transformer and anywhere from 5 to 8 more wires not hooked to anything out of the box. The best thing to do is take a deep breath and segregate the wires. There's a white and a black wire that go to the transformer. These need to be hooked directly to the switch on the handy box. 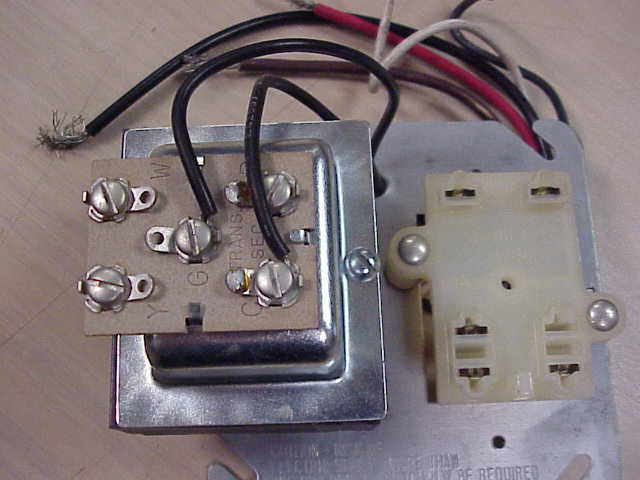 There are two low voltage wires that activate the relay. On is on the "G" and the other on the "C" terminal: leave these be. As for the wires to the blower on the relay, you have to remember that all this is likely a single pole, double throw relay, or a double pole, double throw relay. You will have a wire going in to power the blower from the handy box. Assuming that the blower has multiple speeds, you will need one for heating and one for cooling. Usually, the red wire off the blower is the one for cooling and the black one is for cooling, as the red is low speed and the black is high. The white or neutral wire is connected to the other neutral wires. Since the fan limit control is controlling the blower on the heating cycle, that one will need to go to the normally closed terminal on the relay. This is marked by an equal sign with a line going through it. Because the fan on the cooling cycle is controlled by the thermostat, and the relay, you will need to wire this to the normally open terminal on the relay. The symbol for this is like an equal sign. If wired correctly, the electricity will have a path when a call for heat or cooling is made. Maranatha!